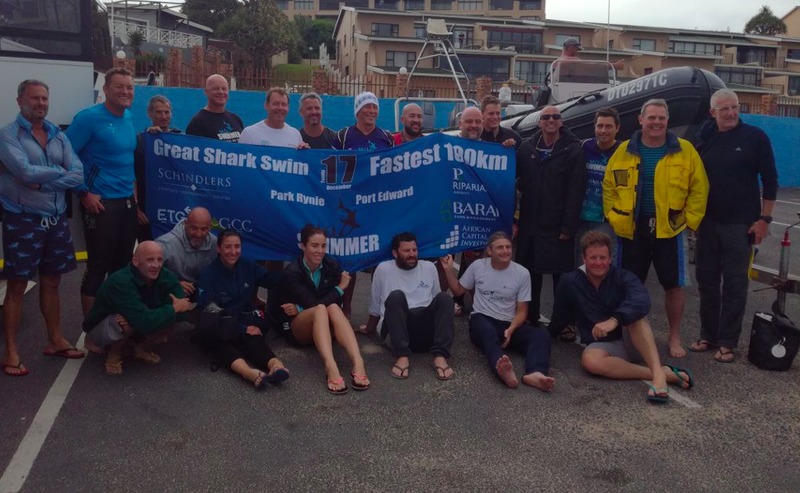 "[The Great Shark Swim] was another epic event in the sense that it was a bridge too far...for now," described Nicolene Steynberg of Madswimmer. "Stopped by the smallest blue bottle versus the initial expectations of shark danger. 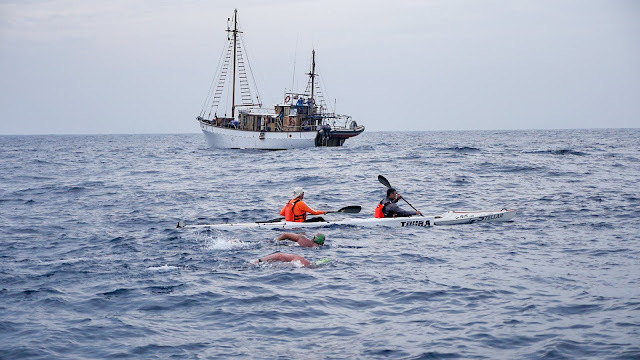 It was the first attempt for such a swim - 36 km out to sea, trading a tricky current given Natal Pulse and Durban Eddy, notwithstanding sharks and blue bottles, seasickness, many swimmers and support crew were affected by the far, bumpy boat ride to the start, which meant a DIFFICULT start for many, and weather and safety concerns." 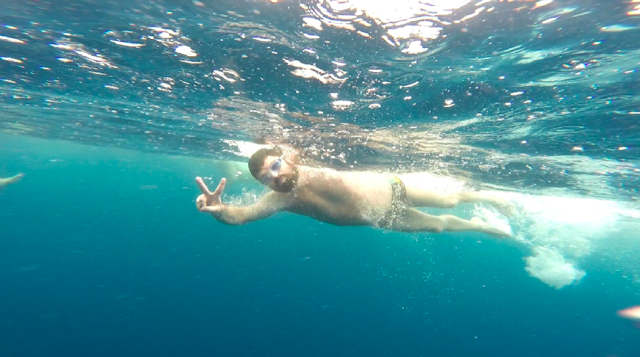 At sunrise on December 2nd, Madswimmer took the plunge to attempt the fastest 100 km swim ever in one day. 21 swimmers and a 24 support team made their way to the mighty Agulhas Current about 20 km offshore from Park Rynie - to swim to Port Edward to raise awareness for sharks being on the verge of extinction. Over the last several months, Madswimmer involved numerous experts who contributed to the meticulous planning of this swim. Founder Jean Craven explains, “We were at the mercy of nature. Weather-wise no one could predict 6 months in advance the best day to swim. Above all, the current speed varies and can change overnight. We knew from the start that we would need both good weather and a fast current on the day to attempt a record like this. Meanwhile, my team had to plan as if the swim was 100% certain to go ahead on the set date. We allowed a one-week window period from December 2nd to the 8th. Swimmers from as far as Israel and Spain booked out time to be available over the full period. On November 28th, we got the rather worrying news from the oceanographer on our team that a Durban Eddy, and possibly worse, a developing Natal Pulse, was causing a reverse current. By December 1st, the current was moving in the right direction again but at a slack pace of 0.6 knots/hour. We needed a minimum of 2.2 knots/hour to attempt the record. Current forecasts for later in the week were rather uncertain too. We decided to go with the relatively good weather forecast of the next day (2nd), trusting that current speed would pick up overnight. 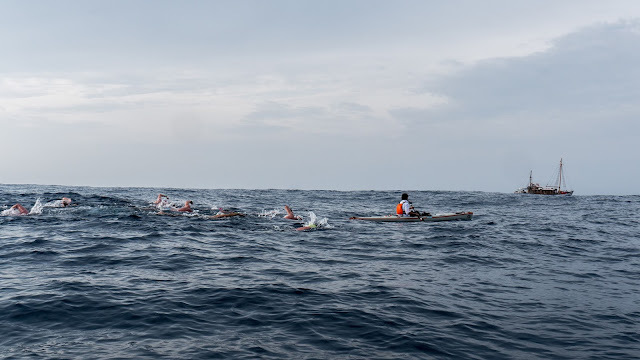 The possibility of better conditions were too uncertain later in the week and waiting could mean that we may have had to forfeit the swim altogether, if elements didn’t align and we ran out of time. At 3 am on December 2nd, we got news that the current speed had increased to 1.5 knots/hour. 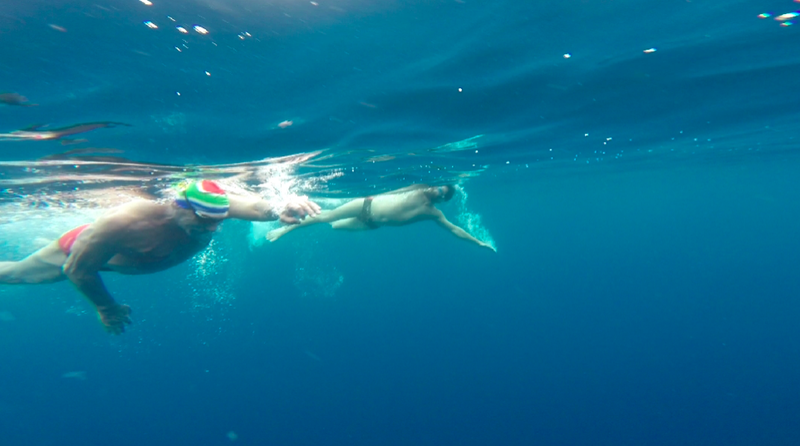 Although it was not what we hoped for a year ago when the idea of this swim was born, it was the green light to make the best of this once-in-a-lifetime opportunity to swim in shark-infested waters, unprotected, in the today-rather-not fast Agulhas Current to show that we care. Unfortunately the swim was aborted after 9 hours 3 minutes due to a bush of blue bottles we encountered, just when we hit better current. We had covered a distance of 28.24 km. 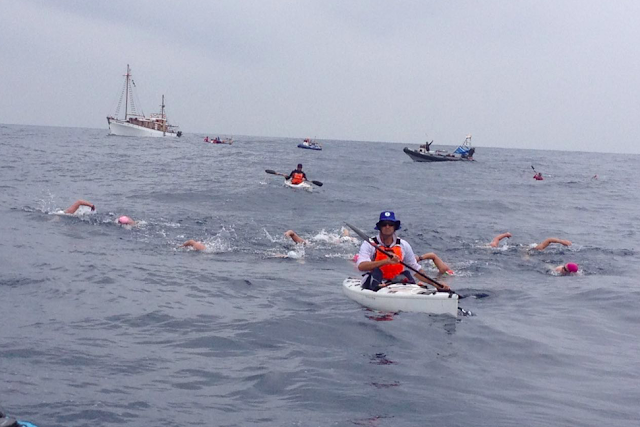 Although we did not reach our goal, I am incredibly proud of our swimmers who sacrificed their time in aid of nature. 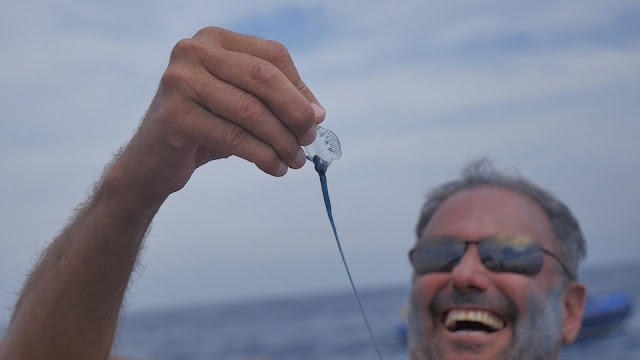 We would have loved to encounter sharks instead, but were at the mercy of nature, blue bottles. The swimmers are all achievers in their own right, but today they have sacrificed personal goals for a cause. I hope the swim encourages others to do their small part to make this world a better place. Madswimmer is a non-profit organization consisting of anyone who is willing to attempt daring open water swims for charity. We have completed a number of records and world-first swims and have raised over R800,000 for children in need. Although the Great Shark Swim has shone the light on sharks, all funds raised will benefit Madswimmer's registered children's charities."